What's the point in growing creeping junipers? At the most practical level, these ground covers are vigorous growers that will help you suppress common lawn weeds and other unwanted plants. When it comes to beautifying your landscaping, they are superior to grass because they don't have to be mowed. Their roles in taming steep hills and in making life hard for weeds only begins to tell the story behind why creeping junipers are so popular. Learn how to plant these ground covers, what some of the best types are, and what assets they bring to your landscaping. 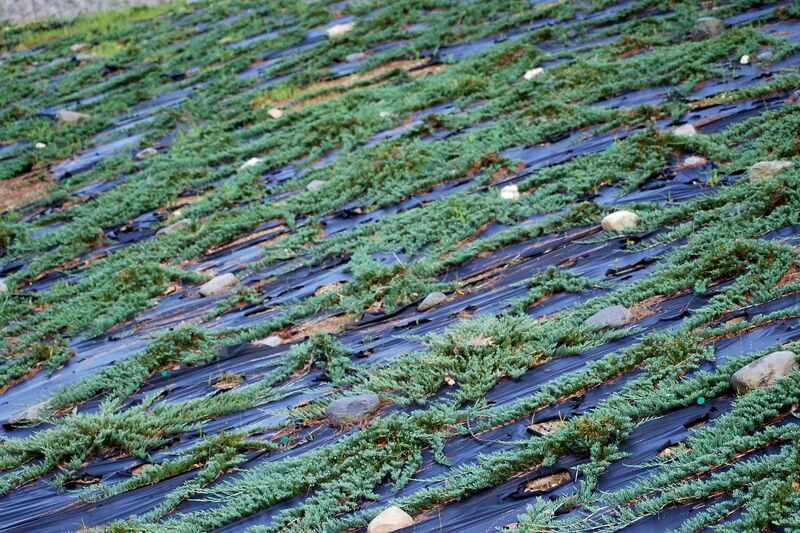 One popular type of creeping juniper is the Juniperus horizontalis 'Blue Rug' ('Wiltonii' is similar). Notice how the plants in the photo are poking out through holes in what looks like black plastic? Well, an explanation is needed regarding what this material really is, how to install it, and why this covering works hand-in-hand with such a planting of creeping junipers. The material shown in the picture is landscape fabric, not black plastic. People do sometimes use the latter, but the advantage landscape fabric (which is also called "weed barrier") enjoys is that it breathes, meaning that a certain amount of air and water will be able to reach the plants' root systems. One mistake the homeowners have made here is in failing to cover this material with mulch. Left exposed to the bright sunshine for too long, the weed barrier will suffer damage. Besides, you'll want to apply a bit of mulch in the holes, too, thereby discouraging weeds from sprouting up right next to your creeping junipers. The idea is that, between the landscape fabric, mulch, and creeping junipers, few weeds will emerge, the soil will be held in place, and the area will be beautified. Consider these three components as a team that works together for weed control, with the prime functions of the creeping junipers being soil erosion control and aesthetic enhancement. Although you don't necessarily have to do it in this order, experts recommend putting the weed barrier down first, installing the creeping junipers (cutting holes into the material to provide access) next, and, finally, spreading the mulch on. The likelihood of success will be greatly increased if, prior to installing these three components, you kill any grass growing in the area, as well as any weeds. In extreme cases, you may wish to try soil solarization. Even out the surface with a steel rake and remove sharp objects that could puncture the weed barrier. Before moving to the next entry, take a closer look at this planting. Do you notice the weeds starting to emerge? Apparently, the weed barrier was torn by sharp rocks or roots that the homeowner failed to remove prior to installation. Weeds, ever the opportunists, will be quick to exploit such openings. In a case like this, if the weeds aren't removed pretty soon, the whole enterprise will be put at risk. The weeds will spread quickly, causing further ruptures in the landscape fabric. The adjective in the name, "creeping junipers" is sometimes a cause for concern when you hear it associated with a plant. After all, who wants a garden thug that is going to creep into parts of your flower borders where it does not belong? But ground covers are different (by definition) from other plants in this respect. You want them to spread (within reason) and cover up a patch of ground; this is their raison d'etre, right? Never will you be gladder to see a plant spread out quickly over a patch of ground than when you have planted creeping junipers on a steep hill to solve any of the various landscaping problems you may have previously encountered in such a challenging area. One of the major difficulties in maintaining such an area is mowing it. Not only will an incline like this be a bear to mow, it will also be downright dangerous. Some use a Flymo hover mower to do their mowing on a such a hill. It's an ingenious invention for such circumstances. The Flymo has no wheels. Instead, a fan causes this lightweight mower to levitate. You can tie a rope around the handle and lower the mower down the steep hill. As it descends, the Flymo cuts the grass. When one strip has been cut in this fashion, you haul the mower back up the slope using the rope, then repeat for the next strip. This method works—but it is a lot of work. Perhaps this method is best reserved for strapping youths. When most middle-aged people see a steep hill like this, they think to themselves, "The last thing I'd want is to have to mow this!" So if you own a property with a steep hill like the one in the picture, plant creeping juniper just as these homeowners have done—and rejoice to see it fill in as thickly as it has here. Now that most of the heavy lifting is out of the way, you look at how creeping junipers can be used to beautify steep hills and other spots in your yard. In the process, you will learn about some of the characteristics of these plants that suit them so well to the roles that they perform. Consider the picture at left. It serves as a reminder that, as evergreens, creeping junipers are moderately promising for adding to your yard's winter interest. One must say "moderately" because, being short plants, they will be covered by deep snows, robbing you of any visual interest. But in the absence of significant snowfall, their foliage will break up what would otherwise be a drab expanse of white, gray and brown during the winter months. 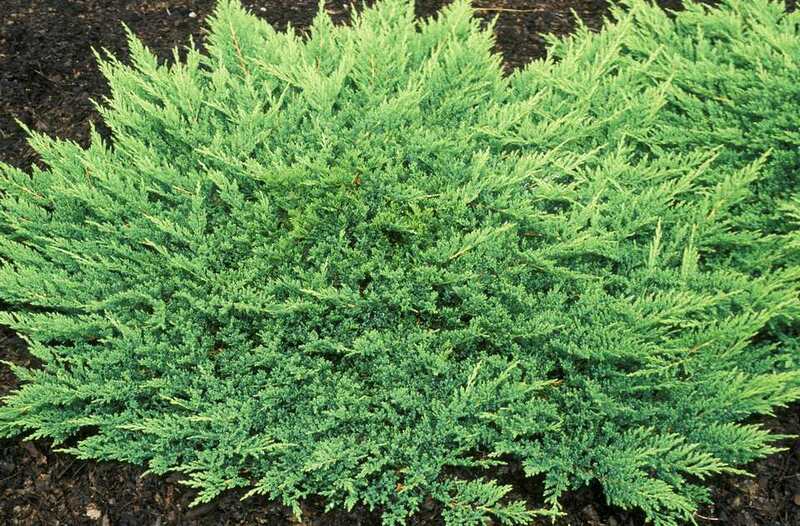 Creeping juniper can be planted at the edge of a sidewalk or street. This photo has been incorporated to illustrate the point that creeping juniper isn't just for steep hills in out-of-the-way places. As you can see, this planting borders a sidewalk, a hop, skip and a jump from the street. As a short plant, this ground cover is tidy enough to fit in easily as part of one's front-yard landscaping, even if you're the type who strives for that well-manicured look in this highly visible portion of one's landscaping. The creeping juniper is bordered by a nicely maintained lawn (from which it is separated by trench edging). These homeowners obviously like to be meticulous, and the ground cover that they've chosen won't be "bucking the system." Need Something to Plant Around a Mailbox? Mailbox plantings can be tricky. For one thing, your ground covers will need to be tough here. At the very least, they should be pollution-tolerant. And in case you don't have a chance to water this area of the yard, it's helpful if they're also drought-tolerant ground covers. Creeping junipers can fit the bill on both counts. Notice that another plant is present, too: some sort of golden sedum, perhaps an Angelina stonecrop. Observe, too, that in this case, the ground covers are occupying flat land. Just because creeping junipers are wizards at covering steep hills, there's no rule that says you can't grow them on flat land. All these ground covers for sun need is full sunshine and sharp drainage. People like the look of greenery cascading down a hillside and spilling over the edge of a wall, as in this picture. The greenery serves to soften the appearance of the hardscape. Here, the structure happens to be a dry-laid stone wall. But this aesthetic concept applies equally to mortared stone walls. Take a look at the landscape in this picture. On such an incline, it's hard to imagine very many ground covers that could succeed better—both in aesthetic and in practical terms than creeping junipers. The informal outdoor steps in the picture are made of landscape timbers. For ideas on building more formal landscape stairs, using masonry, consult the resource linked to here. One can encounter the little plant in the picture growing wild while on a visit to Cadillac Mountain in Bar Harbor, Maine. This promontory is the first spot in the United States, according to some, to see the sunrise in the morning. That makes sense. Perched upon the summit of Cadillac Mountain, you feel as if you're hovering over the Atlantic Ocean, as the salt-laden sea breeze wafts up to your invigorated nostrils. And they don't call this area "Downeast Maine" for nothing: Maine is the easternmost state in the U.S.
What's the significance of finding wild juniper in such a locale? It's a good indication that this genus is well represented among the salt-tolerant plants. The 'Bar Harbor' cultivar (see below) has its roots in this part of the country. In addition to this tolerance for salt, creeping junipers are deer-resistant ground covers. As mentioned above, they also tend to tolerate pollution and dry soil. That's a lot of tolerance for one group of plants. You're not stuck with just one type of creeping juniper when it comes time to find a vendor and buy one. For example, if you want a blue type, besides 'Blue Rug' and 'Wiltonii' there are choices such as Juniperus horizontalis 'Blue Prince,' which is equally low-growing (about 5 inches). Juniperus horizontalis 'Bar Harbor' will become taller (about 1 foot). Want a plant that has green foliage and stays short? Juniperus horizontalis 'Prince of Wales' (about 6 inches tall) fits the bill. Or how about an even shorter plant? Considering how relatively low-growing all these plants are, you may think it strange to speak of a "dwarf creeping juniper." But such a thing really does exist: Juniperus horizontalis 'Pancake' (only about 2-3 inches tall). For a different look altogether, try Juniperus horizontalis 'Lime Glow,' which gives you a chartreuse color. It stands approximately 1 foot tall (or a bit more). What, not enough color for you? Maybe only flowers can satisfy your quest for color.